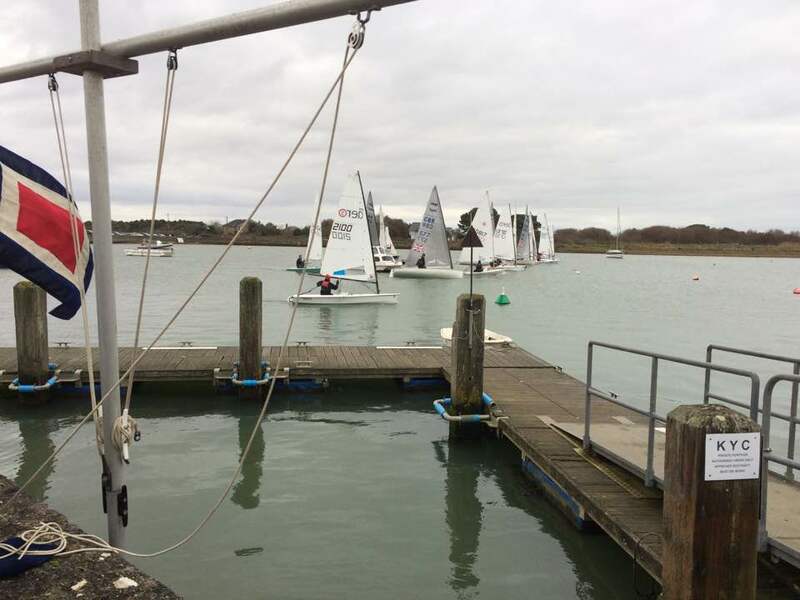 On a cold first day of 2017, nine RS Aero’s and eleven other boats, from Lymington and Keyhaven, assembled at Keyhaven Yacht Club, at the very western end of the Solent, for their annual Rum Race – a great way to see in the New Year! With the forecast for mid-20’s the majority of the fleet opted for a smaller rig than usual, although some regretted it later as that much wind didn’t materialise. A course was set starting on the club line and then out towards the Solent and around the marshes within Hurst spit. Being the Rum Race all you had to do to enter was have a tot of rum after the briefing, which was a bit harder for those who had been out the night before! In the RS Aero’s, Liam, Dave and Peter got off to flying starts with Nev and Alex close behind. After a close sprint with Liam to the first corner, Peter Barton took an early lead. It was a close battle for 2nd and 3rd between Liam Willis and Nev Herbert with Nev just sneaking away at the end to claim 2nd place. It was then another close battle for 4th and 5th between Alex Hayman and David Ellis until Alex ran aground and decided he needed a walk, which almost allowed Karl Thorne to slip through but was just unable to catch him. Jon Harvey and Julie Willis in the 5 rigs came though shortly after to claim 7th and 8th placed Aero on PY. Richard Lilly in the only 9 rig bought up the rear having started well but missed out a mark of the course and had to go back. The six Aero 7’s took the first six places overall to make it a resounding win for the Aero class. The course around Keyhaven marshes had an abundance of square reaches right from the start and the RS Aero 7 managed to plane nicely for most of the course! All in all, it was a great fun race and a great way to start the new year.